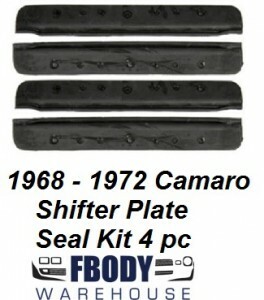 This is a new replacement 4 pc shifter bezel seal kit for use on 1968 - 1972 Camaro Center Consoles. This is a new replacement 4 piece shift bezel seal kit for use on 1968 1969 1970 1971 1972 Camaro models. Quality molded neoprene seal with steel insert spine, set of four.